Maybe you guys have heard of “micellaire” water (that’s the French spelling) - it’s one of those products that editors are always picking up at pharmacies when they’re abroad … just simple cleansing water, ‘cuz the French make everything elegant and easy. Anyway, now you don’t need a plane ticket. 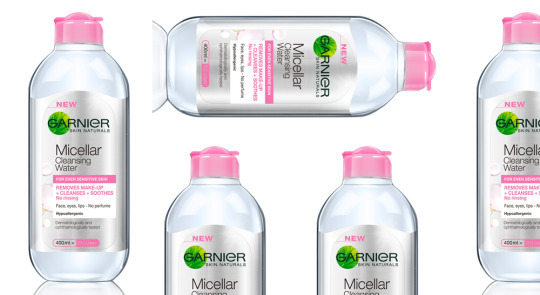 Garnier’s SkinActive Micellar Cleansing Water just launched stateside. Created for all skin types, it not only removes your toughest makeup but it also refreshes and cleanses. It leaves your skin feel hydrated and clean without parching … this is my jam for post-horse riding winter temperature please-don’t-make-me-break-out dusty face when I cannot bring myself to actually wash and dry my face (so drying and chilly-making). The coolest part of this new cleansing water is that you don’t need to rinse your face after use … powerful yet gentle on your skin, makes life easier … now only if it came with a warm croissant.